The Economic Development Strategic Plan has been finalized. View it here or you can pick up a hard copy at the Village Office. The purpose of the Strategy is to identify realistic and practical steps that can be taken to improve the future economic prospects for the residents, businesses and stakeholders in the community. Thank you to the Province of British Columbia, through the Ministry of Jobs, Tourism and Skills Training for all the funding towards the Strategy and EDCD Consulting who developed the plan for the Village. Register your business for free on The Supply Chain Connector. This is a value add service for your business. The program is up and running again this year to our Commercial Businesses, Not-For-Profits, B&B’s and Home-Based Businesses. Grant Application are available at the Village of Fraser Lake Office and have to be submitted no later than July 26, 2019. Village of Fraser Lake Business Façade Improvement Program. Who can join the Fraser Lake & District Chamber of Commerce? Membership is open to any business, industry, organization, civic group as well as interested individuals. Fill out an application and fax it to 250-699-6469. At present, the economic prosperity of Fraser Lake rests on the forest industry. 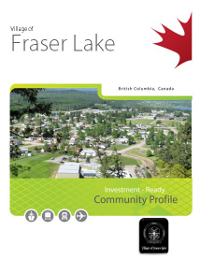 Approximately 36% of Fraser Lake’s population is employed at either West Fraser Sawmill, or in supplying the sawmill with logs. After the recession of the 1980s, Fraser Lake experienced economic benefit from significant growth in secondary industries. Tourism is increasingly becoming a competitor in the economy. Fraser Lake’s relative geographical position, splendid beauty and wealth of wilderness attractions offer the area a natural advantage. To capitalize on the natural beauty of the are the municipality has initiated projects such as the Fraser Lake Wharf Reconstruction. This project restored lake access for area residents and tourists, creating opportunities for recreational fishing and boating. Restoration of this key public infrastructure created five direct jobs and is asset for attracting tourists. The $605,350 project was initiated in June 2004. The Village of Fraser Lake received $245,850 towards the costs of reconstructing the historic public wharf through the Softwood Industry Community Economic Adjustment Initiative (SICEAI) administered by Community Futures. Economic Development involves activities and actions on the part of government, community-based organizations, businesses, industry groups and citizen volunteers to improve the sustainability and economic outlook of their community or region. The process of developing and maintaining suitable economic, social and political environments, in which balanced growth may be realized, increasing the wealth of the community. Economic development is a process with a series of steps that build on each other to create a desired product or outcome. Process also implies there is evaluation at every stage. In this way the organization is able to make adjustments at each stage that will allow it to make better use of its resources and assist it in achieving its goals. The community or region must determine what it feels is suitable. The population characteristics, resources and the desires of the residents will affect the types of economic activity that will be accepted within the community. Reference to the economic, political and social environments highlights the fact that economic development does not happen in a vacuum. The economic, political and social aspects of life interact in complex ways. Balanced growth is an important consideration for a community or region. If the economy of a community or region depends heavily on one industry, it will feel the effects of the peaks and valleys of the business cycle of that industry. Diversification can lessen the impact of a single event in one market or industry on the local economy can be made less dramatic. Each community or region defines wealth differently. In many instances wealth is determined solely in financial terms. The estimate of wealth may or may not include job creation, direct project costs, additional assessment base and/or lifestyle considerations. Economic Development Officers work with their organizations and a variety of partners, as both a facilitator and catalyst, to help create an environment in which communities can thrive, businesses can grow and people can prosper.